Corporacion Industrial Uruapan, CIU, a Mexican company that strives to produce quality products and customer satisfaction, has more than 30 years of experience in the post-harvest sector and, over these years, has managed to improve and perfect the quality of its equipment. CIU specializes in the design and manufacture of computerized sorting machines, which are designed according to the specific needs of the client. CIU develops automated and semi-automated packaging lines, capable of selecting, through an artificial vision system, a wide variety of fruits and vegetables by weight, color, size, defect, and shape. Currently, CIU has an area that specializes in software development, which is made up of a multidisciplinary engineering group that is dedicated to designing, developing and implementing the optical, electronic and software system, which is subsequently integrated into the CIU classification system. The vision system can be configured according to how customers want to classify their product. The company offers 3 system options; RealVision, which integrates color or infrared cameras that inspect the fruit from a single angle, i.e. the most basic configuration which is optimal for tomato, guava, Italian lime, or light fruits in general; DualVision, a configuration in which the fruit is inspected from two different angles, which increases the precision in the measurements. 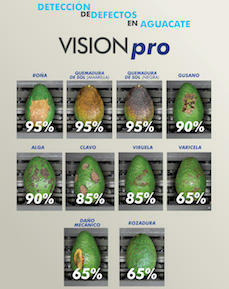 This system is also used for the same products (fruits and vegetables) as RealVision. And, finally, VisionPro, a configuration that combines color cameras with infrared cameras, to take advantage of both technologies. This configuration can be used on dark-colored products such as Persian lime, peppers, and cucumbers. One of its main advantages is that it is able to determine with greater precision, aspects concerning the shape of peppers, cucumbers, tomatoes, and defects in avocado and lemon. In the specific case of avocado, it is possible to detect and differentiate defects, such as scab, sunburn, screwworm, algae, clove, smallpox, chicken pox, mechanical damage, and chafing. To obtain a better result in this classification, the sorter's calibration, lighting, and cleaning should be optimal. The classification software, together with the robustness of the mechanical systems, also designed by CIU, offer great possibilities for a correct handling of the production of its clients around Mexico and Latin America, mainly. In addition to the aforementioned fruits and vegetables, the system can be adapted to select very small fruits, such as cherry tomatoes and lemons (in all of its varieties), as well as larger sized fruits, such as pineapple, watermelon, and coconut. The classification system is constantly evolving. Currently, CIU, is working on the detection of defects in potatoes and tomatoes, in addition, it seeks to implement a solution to determine dry matter content and sugar in fruits with the use of near infrared spectrometry (NIR). In smaller products, such as cherry tomatoes, each sorting line can work with up to 700 kg per hour, as the system can sort up to 25 fruits per second per line. For medium-sized products, such as Hass avocados, the system can sort up to 5.4 tons per hour per line, with a speed of up to 12 fruits per second. CIU's trajectory and evolution is supported by the design and manufacture of more than 800 projects that have been installed in different parts of Mexico and in other countries, such as: the United States of America, Peru, Colombia, Dominican Republic, Honduras, Guatemala, El Salvador, Panama, Chile, Brazil, and Israel.